Meyer is director of engineering for Ozonics LLC, a Mason City maker of ozone-generating devices designed to eliminate the scents of hunters. The 10-year-old company now makes more thousands of such devices each year, but its market is always growing and changing. New prototypes are always required. CIRAS project manager Paul Berge demonstrates capabilities during a tour of the CIRAS Materials Lab. Ozonics since has worked with CIRAS on several new versions of its products – versions that were prototyped, through a CIRAS relationship, on a cutting-edge 3D printer at the University of Iowa. Meyer says the new technology has helped Ozonics remain competitive because the company is able to move rapidly through various iterations and quickly perfect its designs. CIRAS, which has another round of lab tours scheduled for October 18, also has been working over the past year or so to expand that phenomenon by flipping the process and taking its lab tours on the road. A November 15 event at Northeast Iowa Community College in Calmar represents the latest incarnation of a CIRAS technology roadshow. 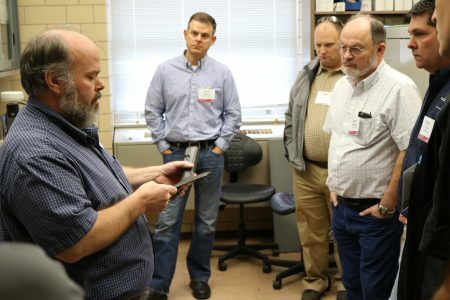 Entitled “ISU Lab Resources for Manufacturers,” the half-day presentation is intended to showcase the various tools available at Iowa State for far-away manufacturers who, unlike Ozonics, may not immediately see the point of visiting the campus in Ames. For more information about the ISU Lab Resources for Manufacturers event on November 15, visit this registration link. To request a CIRAS technology road show in your area, contact Chris Hill at chhill@iastate.edu.